Many of us grew up reciting John 3:16 with the picture in mind of accepting Jesus Christ as our Lord and Savior so we could go to heaven. My precious brother asked that I talk more about heaven, I will, in our next blog. But, for this blog, I want to pose the question, Is This True, Jesus Said He Came to Die So We Can Go to Heaven or did He have another more important purpose to fulfill? It is very interesting the scripture never said ‘will go to heaven.’ It says, SHALL NOT PERISH BUT HAVE ETERNAL LIFE. What does it mean shall not perish but have eternal life? In the Greek, the word perish – (apollymi) to be destroyed forever, to put to an end, to ruin, to be lost. To be put out of the way entirely. In the Greek, the phrase eternal life – (aionios) (zoe) without beginning and end. That which has been and always will be, without end, never cease. It also means Everlasting Life. vitality, the breath of life. Jesus’s purpose on earth was not merely to take us to heaven, but to give us Life… His Life. He is God, THE ONE without beginning and end… Alpha – Omega. He has been, always will be, and will never cease to be. We were all born dead in our trespasses and sins, (Ephesians 2:1) because of Adam’s disobedience. We lived in total darkness following the ways of the world. We were held captive and slaves to sin and the evil one. What we accomplished without Him living His Life in us, no matter how good it was, was still darkness, sinful, and wretched. We had no goodness within us! Humanity was lost and perishing in its state forever. So, Jesus came to breathe His Life back into humanity; to all who believed Him and welcomed Him into our hearts. 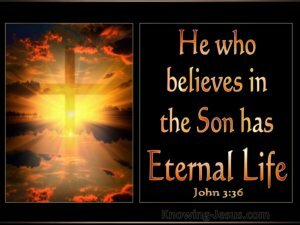 JESUS IS OUR ETERNAL LIFE! John 3:36 He who believes and trusts in the Son and accepts Him [as Savior] has eternal life [that is, already possesses it]; but he who does not believe the Son and chooses to reject Him, [disobeying Him and denying Him as Savior] will not see [eternal] life, but [instead] the wrath of God hangs over him continually. John 5:24 I assure you and most solemnly say to you, the person who hears My word [the one who heeds My message], and believes and trusts in Him who sent Me, has (possesses now) eternal life [that is, eternal life actually begins—the believer is transformed], and does not come into judgment and condemnation, but has passed [over] from death into life. John 5:34 But the testimony I receive is not from man [a merely human witness]; but I say these things so that you may be saved [that is, have eternal life]. John 5:39 [Testimony of the Scripture] You search and keep on searching and examining the Scriptures because you think that in them you have eternal life, and yet it is those [very Scriptures] that testify about Me. John 6:40 For THIS IS My Father’s Will and Purpose, that everyone who sees the Son and believes in Him [as Savior] will have eternal life, and I will raise him up [from the dead] on the last day. John 6:47 I assure you and most solemnly say to you, he who believes [in Me as Savior—whoever adheres to, trusts in, relies on, and has faith in Me—already] has eternal life [that is, now possesses it]. John 17:3 Now this is eternal life: THAT THEY MAY KNOW YOU, the only true [supreme and sovereign] God, AND [in the same manner know] JESUS [as the] CHRIST whom You have sent. I John 5:20 And we [have seen and] know [by personal experience] that the Son of God has [actually] come [to this world] and has given us understanding and insight so that we may [progressively and personally] know Him who is TRUE; and we are IN Him who is TRUE—in His Son Jesus Christ. This is the true God and ETERNAL LIFE. Eternal Life is the Person of Jesus Christ living IN and through us, as we yield to Him and allow Him to reign through us each moment of the day. Jesus told us in John 10:10, “I came that you may have Life and Life abundantly.” The Life He spoke of, was His Own Life, never things, possessions, prestige, or luxury. We have received within our hearts The Life-Giver of the Universe… Jesus Christ! That’s why He came not just to die for our sins or take us to heaven, but to give us Life so we won’t live lost in darkness forever and we can live moment by moment from His Abundance of Life (love, grace, peace, joy, wisdom, and strength)… THANK YOU LORD JESUS! We will go to a place, called heaven, or is this place in us now? Find out in our next blog as we talk a little about heaven. IS THIS TRUE? Everyone WILL BE Saved or Everyone IS Saved?